Joan Arthur is a Registered Dental Hygienist with Langworthy Family Dental. Joan received her Bachelor of Science in Dental Hygiene from the University of Iowa in 1981, making her one of our most experienced hygienist’s! 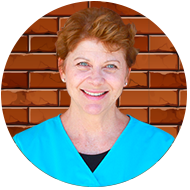 With her 35 years experience, Joan has most enjoyed working one on one with people of all ages, helping so many of them maintain a healthy smile. When out of the office, she enjoys tennis, walking, reading, gardening, and sewing. Spending time with family is a high priority for Joan, as she has four children, Katie, Meghan, Andrew, and Alex, as well as one grandson!